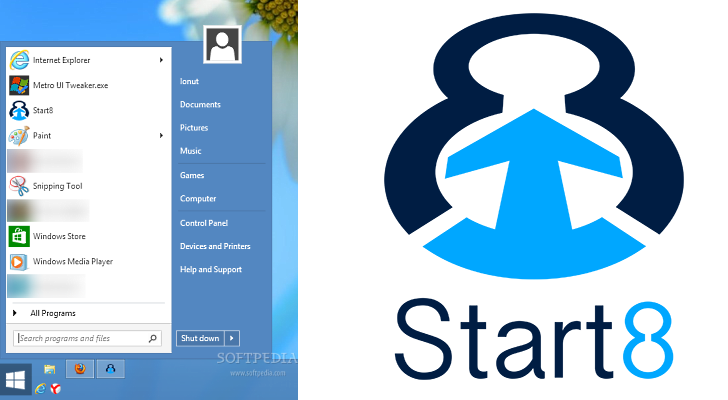 Bring back the Windows® "Start" menu with Start8™! Microsoft Windows® 8 is shipped without the "Start" menu. Stardock heard the cries from Windows 8 users We put the "Start" menu back in Windows 8. We accurately recreated the most used desktop feature billions of users depend on every day and packed it with additional functionality. Start8 is a customization application that brings back the traditional Windows start menu without compromising using the Windows 8 Modern UI start screen. Many people will be confused by Windows 8's new Modern UI. Start8 will bring back the start menu you know and love while still giving you full access to the Windows 8 Modern UI. When you select the Windows 7 style start menu, you'll feel right at home if you've been using Windows Vista or 7, although there's no 'Aero' transparency. If you select the Windows 8 style in Start8, you'll be given a Modern UI style app list. While other Windows 8 start menu replacement apps try to hide the Modern UI from users, Start8 gives you a choice of how to activate it. Since many features in Windows 8 rely on having the Modern UI, it's great that Start8 provides this flexibility. For example, you can set what clicking the Start8 icon activates or what the Windows key on the keyboard activates.